Cold Air: At any price: Reviewing Ontario's FIT review. Last week the Ontario government rushed out FIT review. The review was reported to have been with the minister only 3 days, but that was enough to release it the same day the Opposition Leader's bill to abolish the program was voted on, and defeated, in the provincial legislature. That was a very quick turnaround for a ministry that has been sitting on the Integrated Power System Plan submitted by the same body - the Ontario Power Authority (OPA) - prior to last fall's election. I disagree with the FIT program for a number of reasons - economic, political/social, and environmental (reasons have been explored in previous blog posts one, two, and call this three). I'll again briefly review how the program increases pricing, how it kills jobs, and how it can only increases emissions. I'll also look at the supporters of the policy, and what they have in common that enables them to argue an unsubstantiated positions successfully. The Executive Summary claims 20,000 jobs, but it is difficult to locate the source for the figure. It wasn't that hard to convince people during the election that jobs were being created, because the few subsidized plants can be visited - whereas nobody is paying to put faces on the 330 jobs moved to Buffalo in the past year, or the Xstrata jobs now in Quebec, or the jobs that will flow, with cheap exports to Michigan and the Watertown areas. The accounting is imprecise, but a net benefit not only hasn't been demonstrated, multiple studies, in other jurisdictions, show net job losses due to energy job creation policies. Ontario's total employment figures trend to support those studies. It must also be noted that the price of the $27 billion of investment the government claims from the FIT program added to the deal with the Korean Consortium comes with contracted power purchase commitments approaching $3 billion a year (for under 16TWh of supply). One common refrain has been that the renewable generation thus far introduced can't have increased residential bills because there isn't much of it. It seems rather silly to rebut arguments that power at $110+/MWh, supported by expensive CCGT (gas) plants to run at low capacity, could bump far cheaper, publicly owned, supply, and bills not be impacted, but ... Most residential consumers know more about the total increase in their bills than the line items those increases are occurring on - and the bulk of the increases previously came on the delivery line (which is convenient for the government as it varies from one area to another). 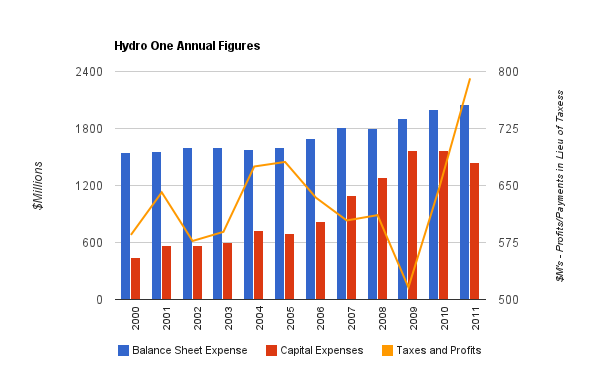 The government attributes this to the sorry state of the system left by the previous regime, but reviewing Hydro One's annual reporting that doesn't hold up. OM&A expenses are up only 32.5% over the past decade - capital expenditures are up 5 times that percentage. I don't need to argue that the spending is primarily driven by new initiatives - the bookkeeping says it is. 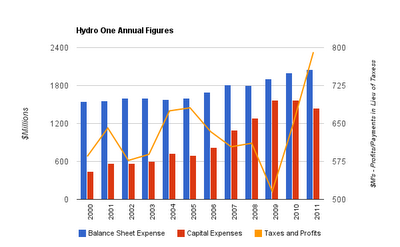 Hydro One's rates are set on a formula based on a return of equity, so they have an incentive to categorize expenses as capital expenditures - but certainly a great amount of spending is being done to accommodate intermittent renewable generation sources (including the smart grid initiatives to facilitate more distributed generation sources, and to influence demand profiles). Industrial wind turbines, and solar panels, are not expected to lower greenhouse gas emissions in Ontario - nor are they likely to reduce any other type of emissions. The Ontario Society of Professional Engineers (OSPE) recently released a report titled "Wind and the Electrical Grid: Mitigating the Rise in Electricity Rates and Greenhouse Gas Emissions." That report is fine, but it makes some assumptions that are questionable including suggesting Ontario could get long-term power purchase agreements from other jurisdiction, for clean electricity production (in terms of greenhouse gas emissions). The suggestion is not credulous. The New England states, including Massachusetts, refused defining hydro as clean specifically to encourage local generation over clean imports (not only from Quebec, but if there was free trading the 4000MW undeveloped on the Churchill system would likely find a way to be developed). Similarly, hydro projects in Manitoba are seeing big reductions in commitments for long term PPAs from Minnesota, concurrent with Minnesota planning to move to more local production. Ontario is a poster child for how not to trade to begin with - having both protectionist legislation for production, and dumping excess production far below the price paid within it's borders. The other mistake OSPE makes is assuming the government has any intention of maintaining greenhouse gas levels at the low level they have finally returned to. 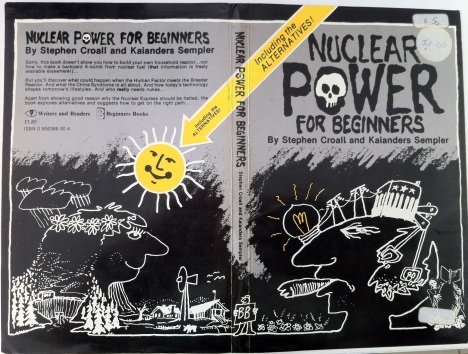 The last time we were at emissions levels this low the environmentally credentialed Maurice Strong had just taken over Ontario Hydro and nuclear units would soon start to be idled, as coal units would be cranked up. Between 1994 and 1998 CO2e emissions would double, and by 2000 emissions were 2.5 times what they were in 1994. The country most often cited as inspiration for Ontario's FIT, and related energy policies, is Germany. Despite the absorption of dirty East Germany, German electricity generation from fossil fuels (lignite, hard coal, natural gas and petroleum products) is unchanged since 1990 (translate last listed .pdf here). Emissions are not the target of the supporters of renewables. In Ontario, as in Germany, it is increasingly clear that the nonsense about what renewables are supposed to be doing (generating electricity) is simply a mask for what they really are doing - which is eliminating the possibility of having significant baseload supply operating on the grid. Specifically, they are weapons to displace nuclear. And in blessing this FIT review, Bentley has moved to finish off the annihilation of Ontario's nuclear sector started by Minister Smitherman. Wonderful goods froim you, man. I've understand your stuff previous too and you're just too fantastic. wnat you're saying and the way in which you say it. You make it enjoyable and yyou still care for to keep it wise. I can wait to read much more from you. This is actually a tremendous webb site.